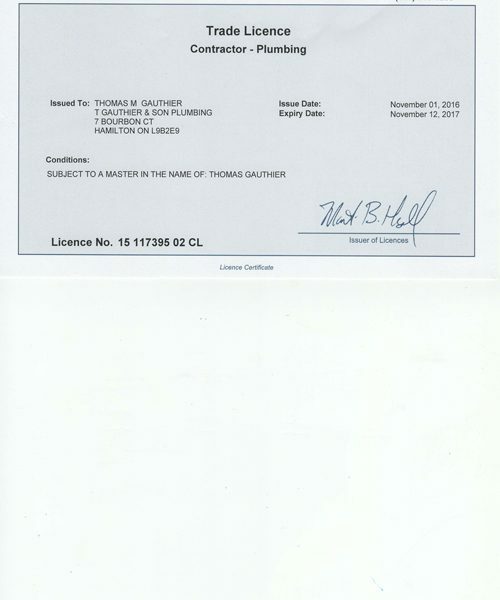 Tom Gauthier & Son Plumbing Ltd.
T. Gauthier & Son Plumbing Ltd.
At Tom Gauthier & Son Plumbing Ltd., we are committed to providing our, customers, with exceptional service. As providing this service involves the collection, use and disclosure of some personal information about our customers, protecting their personal information is one of our highest priorities. While we have always respected our customers, privacy and safeguarded their personal information, we have strengthened our commitment to protecting personal information as a result of Ontario’s Personal Information Protection and Electronic Documents Act (PIPEDA). PIPEDA, which came into effect on January 1, 2004, sets out the ground rules for how Ontario businesses and not-for-profit organizations may collect, use and disclose personal information. This Personal Information Protection Policy, in compliance with PIPEDA, outlines the principles and practices we will follow in protecting, ‘customers’, personal information. Our privacy commitment includes ensuring the accuracy, confidentiality, and security of our ’, customers’, personal information and allowing our , customers, s to request access to, and correction of, their personal information. This Personal Information Protection Policy applies to Tom Gauthier & Son Plumbing Ltd. (Gauthier Plumbing, T. Gauthier& Son Plumbing Ltd.). This policy also applies to any service providers collecting, using or disclosing personal information on behalf of Tom Gauthier & Son Plumbing Ltd. or ( Gauthier Plumbing or T. Gauthier & Son Plumbing Ltd.). Personal Information –means information about an identifiable individual ( Names, Address, Phone number, E-Mail Address and Property owner, Business owner name. ) Personal information does not include contact information (described below). 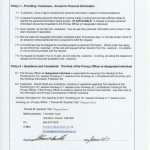 Privacy Officer – means the individual designated responsibility for ensuring that Tom Gauthier & Son Plumbing Ltd. Or ( Gauthier Plumbing or T. Gauthier & Son Plumbing Ltd. ) complies with this policy and PIPEDA. 1.1 Unless the purposes for collecting personal information are obvious and the customer, voluntarily provides his or her personal information for those purposes, we will communicate the purposes for which personal information is being collected, either orally or in writing, before or at the time of collection. To open and manage an account for ; Tom Gauthier & Son Plumbing Ltd. Or ( Gauthier Plumbing or T.
2.2 Consent can be provided [include the methods that apply to your organization: e.g., orally, in writing, electronically, through an authorized representative] or it can be implied where the purpose for collecting using or disclosing the personal information would be considered obvious and the customer, voluntarily provides personal information for that purpose. 2.3 Consent may also be implied where a customer, is given notice and a reasonable opportunity to opt-out of his or her personal information being used for mail-outs, the marketing of new services or products, fundraising and the customer, does not opt-out. 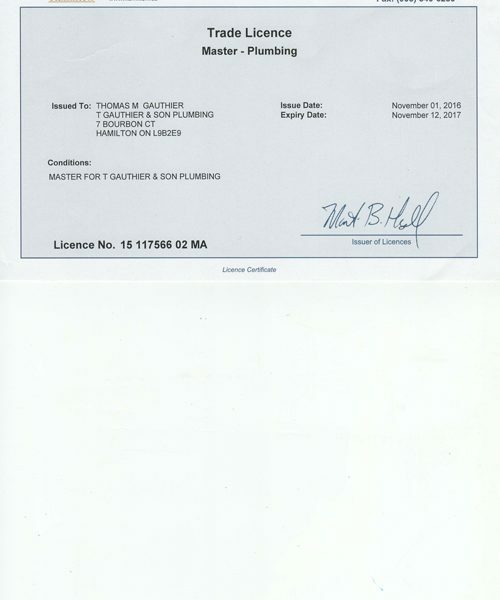 2.4 Subject to certain exceptions (e.g., the personal information is necessary to provide the service or product, or the withdrawal of consent would frustrate the performance of a legal obligation), customers, can withhold or withdraw their consent for Tom Gauthier & Son Plumbing Ltd. Or ( Gauthier Plumbing or T. Gauthier & Son Plumbing Ltd. ) to use their personal information in certain ways. A customer’s, decision to withhold or withdraw their consent to certain uses of personal information may restrict our ability to provide a particular service or product. If so, we will explain the situation to assist the customer, in making the decision. 3.3 We will not sell customer, lists or personal information to other parties [unless we have consent to do so]. 4.1 If we use customer, personal information to make a decision that directly affects the customer, , we will retain that personal information for at least one year so that the customer, has a reasonable opportunity to request access to it. 4.2 Subject to policy 4.1, we will retain customer, personal information only as long as necessary to fulfill the identified purposes or a legal or business purpose. 5.1 We will make reasonable efforts to ensure that customer, personal information is accurate and complete where it may be used to make a decision about the customer, or disclosed to another organization. 5.2 Customers, may request correction to their personal information in order to ensure its accuracy and completeness. A request to correct personal information must be made in writing and provide sufficient detail to identify the personal information and the correction being sought. All computer access require user IDs, passwords, firewalls; restricting employee access to personal information as appropriate (i.e., only those that need to know will have access; contractually requiring any service providers to provide comparable security measures]. 6.3 We will use appropriate security measures when destroying customer’s, personal information such as All files are properly electronically deleted completely from our computer system and all printed documents are shredded. 7.1 Customers, have a right to access their personal information, subject to limited exceptions. 7.3 Upon request, we will also tell customers, how we use their personal information and to whom it has been disclosed if applicable. 7.5 A minimal fee may be charged for providing access to personal information. 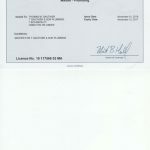 Where a fee may apply, we will inform the customer, of the cost and request further direction from the customer, on whether or not we should proceed with the request. 7.6 If a request is refused in full or in part, we will notify the customer, in writing, providing the reasons for refusal and the recourse available to the customer . 8.1 The Privacy Officer or designated individual is responsible for ensuring Tom Gauthier & Son Plumbing Ltd. Or ( Gauthier Plumbing or T. Gauthier & Son Plumbing Ltd. ) compliance with this policy and the Personal Information Protection Act. 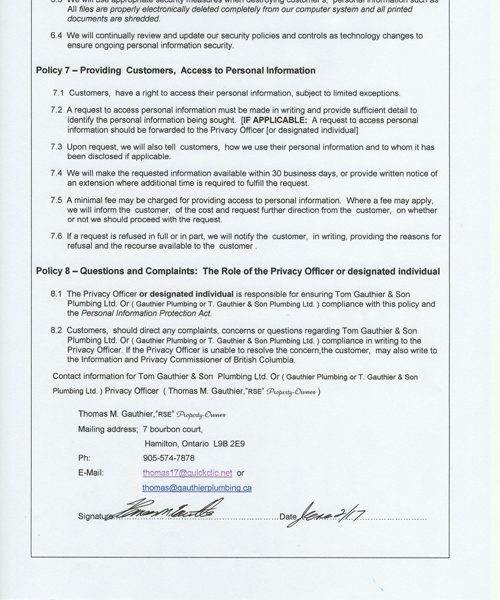 8.2 Customers, should direct any complaints, concerns or questions regarding Tom Gauthier & Son Plumbing Ltd. Or ( Gauthier Plumbing or T. Gauthier & Son Plumbing Ltd. ) compliance in writing to the Privacy Officer. If the Privacy Officer is unable to resolve the concern,the customer, may also write to the Information and Privacy Commissioner of Ontario.